Our bead cruise registration has been filling up steadily and tonight at midnight registration opens to everyone. We did an early bird registration to thank those who went with us last year. 19 signed up in 2 days! I'm so happy everyone had a good time last year and that so many are coming back again! 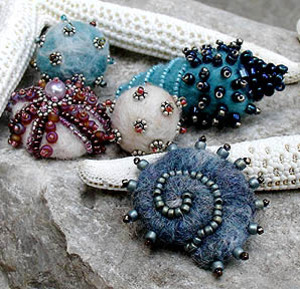 Really, does life get sweeter than beading on a cruise? 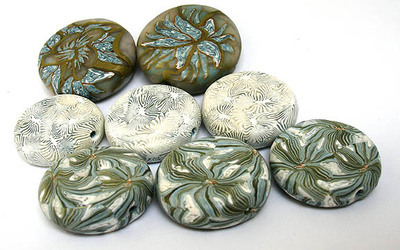 Tropical Flower Trio, a polymer clay bead making class. 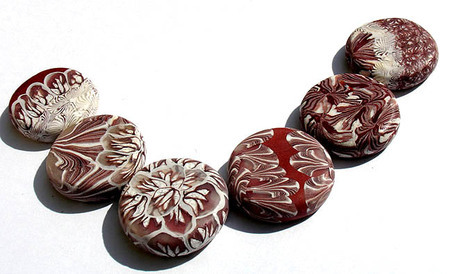 We'll spend the day creating beads using 3 flower designs. 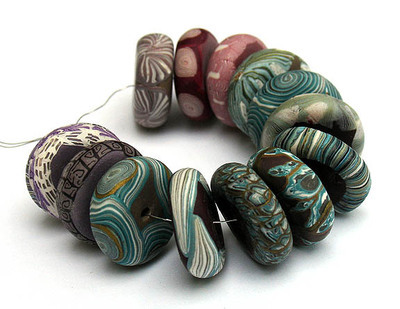 These are easy canes and even a beginner can make beads like these, with a few hints from me! Well, it's a different photo anyway. I'll go through the basics of forming shapes and ways to embellish them. This is the same technique I used to make my starfish. 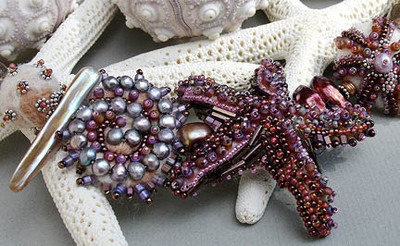 And speaking of my starfish, here is a picture of the whole necklace. These are in a limited edition of 20. 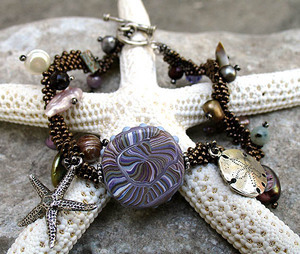 I wanted to create something that reminded me of seashells. I can't tell you how much I miss Lake Michigan in the summer. We'd spend hours on the shore shifting through the sand to find little shells, beach glass and stones that caught our eye. I've just spent 10 days of beading fun with my mom. We've bead embroidered our little hearts out, finished our samples for the Bead Cruise classes and inspired each other all week! This will be a felt bead making class. 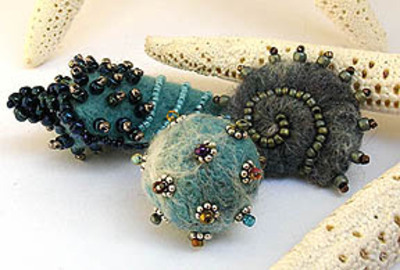 I love the mix of textures with the beads and wool. 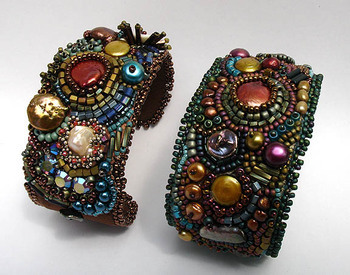 Here are the cuff bracelets that my mom and I made. Mine is on the left. She is teaching this on the cruise, so I got to take her class first! So spoiled. My mom and I have been bead embroidering, I'll have pictures to post soon. She's visiting for a few weeks, yeah! Getting everything ready for the Bead Cruise, registration opens next week. Making jewelry to take to the gallery next month. Not so much on the illustration front. I've been working on stories of my own to illustrate. Now I just need to find the time to work on them. Hope you are enjoying some lazy June days! And so many more: here and here. Happy bidding! 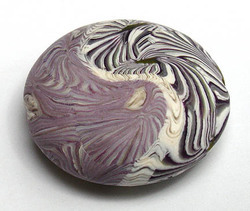 I've been busy making my Bead of the Month. For June, I went with the elements, fire and water. 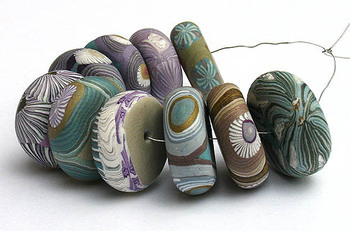 I've been working on new shapes for my beads too. And I'm really loving this new design. I have teal ones that will go up on eBay. I'm also working on this design in some other complimentary color schemes. 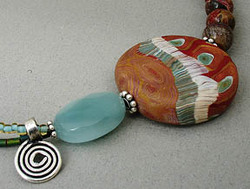 I strung my sample bead with 8 mm poppy jasper beads and amazonite with 2 strands of teal seed beads on the other side. 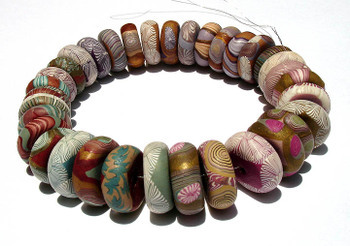 In other bead related news, the Bead Bugle, on online bead magazine has featured me in this month's issue. You can read it here. I've spent most of my week filling orders and making new jewelry. 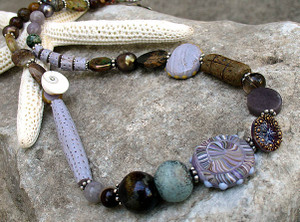 I have a nice little collection of new bracelets and here is a necklace that I designed. The flower comes from JuJu Vail's Creative Beading book. 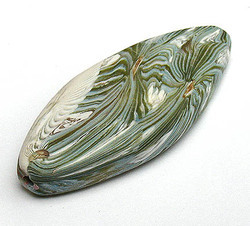 The flower is the clasp with my little disk bead as the other part of the toggle. I wanted a quick and simple design for summer. It's just two stands of seed beads with the bead work in the front. Looks really pretty on. 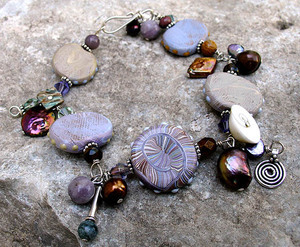 This is my version of the Caribbean Queen Necklace that my Mom designed. It was one of her classes on the cruise. I love what she comes up with for my beads. I would have never thought of a design like this. Click on the image to see it larger. (it's more impressive that way.) 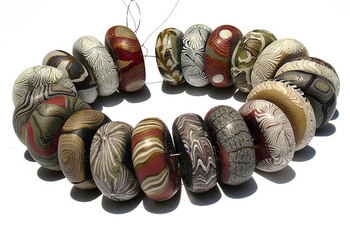 The long beads on the sides are glass beads that I picked up at a recent bead show. 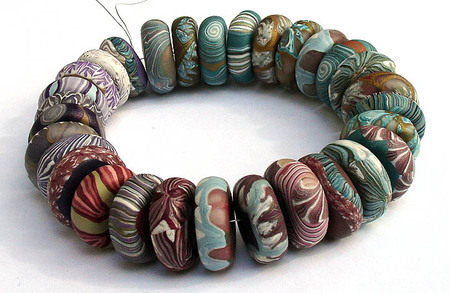 I'm offering the pattern for the Caribbean Queen Necklace on my website for my mom. She's still recovering and asked me to have it on my site. Click here. You can also see another color combo that I did in purples and garnet. 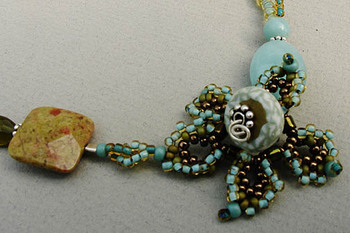 The necklace is for any skill level and can be finished in an afternoon. I was super inspired by Liz to try my hand at bead embroidery. 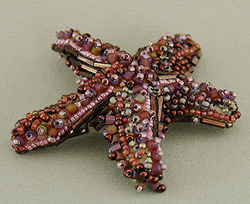 Here is a starfish that will soon be turned into a necklace and used on our Bead Cruise promotional materials this year. 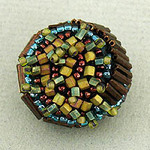 And a little bead embroidered bead. 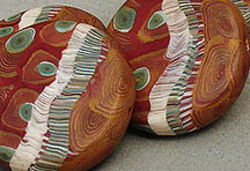 Both were created using a felted form as the base. 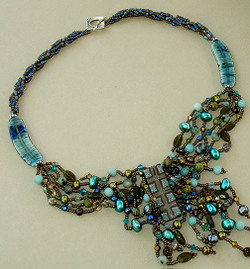 I purchased Beaded Embellishment a few weeks ago and have been enjoying it. It's a great beginners guide. 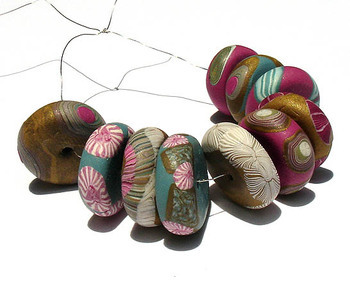 Other bead news, for you international bloggers I have opened up my shop to orders outside the U.S. to select countries. 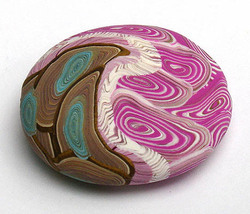 So if you have a Paypal account, you can now shop at www.humblebeads.com. International orders need to be emailed directly to me. You can read all about it on my ordering info. page.